- Dimensions (W x H x D): 17 7/8" x 6 13/16" x 14 9/16"
The VSX-LX102 has Chromecast built-in, the same technology behind Chromecast, so you can use your mobile device to cast your favorite music, radio, or podcasts to your speaker. You can control the audio from anywhere in the house using Cast-enabled apps running on your personal device—iPhone, iPad, Android phone and tablet, Mac and Windows laptop, and Chromebook. Chromecast Built-in will be available with future firmware update. The feature lets you take advantage of the highest-quality video source for viewing on a 4K TV. With support for HDCP 2.2, you can enjoy premium content such as 4K videos with digital copy protection on a compatible display. What’s more, the VSX-LX102 is ready for the HDR (High Dynamic Range) and BT.2020 next generation video standards. Supports up to 4K/60p/4:4:4/24-bit with HDCP 2.2 on HDMI IN (1/2/3) and HDMI OUT (MAIN/SUB). Reflex Optimizer layers MCACC for more accurate measurement when using enabled speakers. High directivity sound reflects off the ceiling, while low directivity sound directly reaches the ears. This difference causes a phase shift, making the sound feel uncomfortable. To solve this, the new technology optimizes the performance of your up-firing elevation speakers for your listening environment, by aligning the phase of direct and indirect sound, matching the basic tone, and optimizing the upward-oriented frequencies. The result is overall seamless sound with Dolby Atmos-enabled speakers, allowing the ideal reproduction of three-dimensional surround sound. The VSX-LX102 will support FireConnect Powered by Blackfire with a future firmware update. 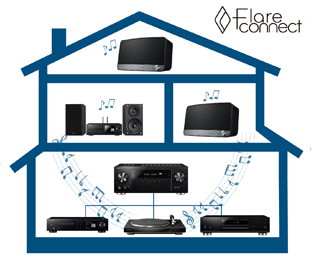 FireConnect is a stable wireless protocol that streams audio from a compatible Pioneer AV Receiver to a compatible Pioneer wireless speaker. Enjoy Bluetooth audio, front USB audio files, and Internet Radio from the FireConnect-compatible Pioneer AV receiver to an optional FireConnect compatible Pioneer wireless speaker(s) located in another room(s). * Chromecast built-in may require a firmware update. * DTS Play-Fi requires a firmware update.